Services are scheduled for 10 a.m. Friday, Dec. 28, at Trinity Temple Assembly of God for Lisa Jane Rodriguez of Artesia. 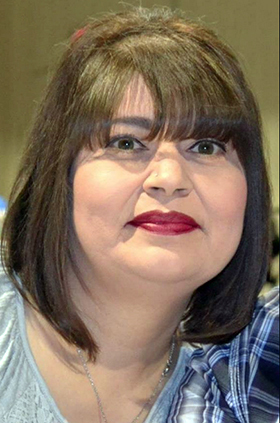 Rodriguez, 47, passed away Saturday, Dec. 15, 2018, at her home. Pastor Cornelio Martinez will officiate the services, with interment to follow at Woodbine Cemetery. Pallbearers will be Israel Catano, Mark Cabezuela Jr., Amos Ortega Jr., Lupe Cabezuela, Gilbert Grado and Nicholas Rodriguez. Visitation began at 1 p.m. today at Terpening & Son Mortuary. Lisa was born Aug. 12, 1971, in Hobbs, the daughter of Reynaldo and Jane (Ortega) Cabezuela. She was a longtime Artesia resident. She was a teacher’s assistant at Artesia Head Start. Lisa attended Trinity Temple Assembly of God. She enjoyed interacting with children of all ages, watching Hallmark movies, leisure time, spending time with family and friends, and watching her favorite NFL team, the Dallas Cowboys. Lisa will be remembered by her strong laughter and love for life and people. She had a welcoming spirit toward others everywhere she went. Survivors include her husband, Abel Rodriguez, of Artesia; mother-in-law Lydia Rodriguez of Hobbs; stepsons Matthew Rodriguez and wife Margarita of Colorado, Nicolas Rodriguez of Colorado, Isaac Rodriguez of Albuquerque, and Steven Rodriguez of Artesia; stepdaughters Stephanie Rodriguez of Hagerman and Raquel Rodriguez of Roswell; and numerous nephews, nieces, cousins, aunts, uncles and grandchildren.